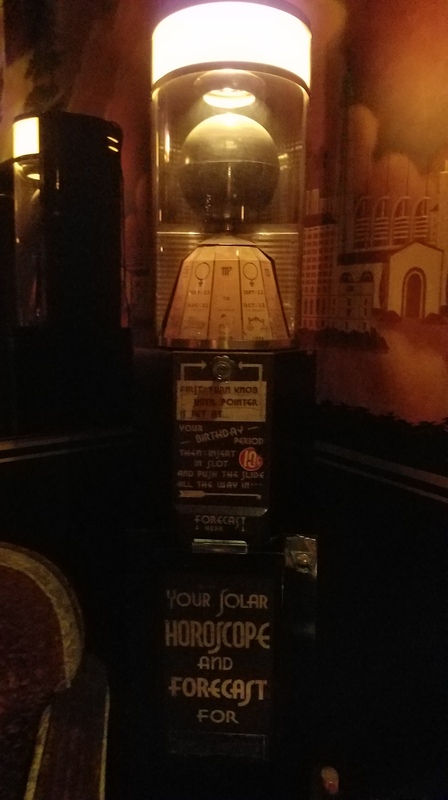 I had the pleasure of visiting two bars in L.A. that have generated some buzz among tikiphiles within the last year. I chose to feature them here together, as I felt it gives me an opportunity to make a point which I feel is pretty important. Many tikiphiles have their ideas of what a Tiki bar is. Many of them also know that there are quite a few “variants”, such as nautical bars, tropical bars, ect. 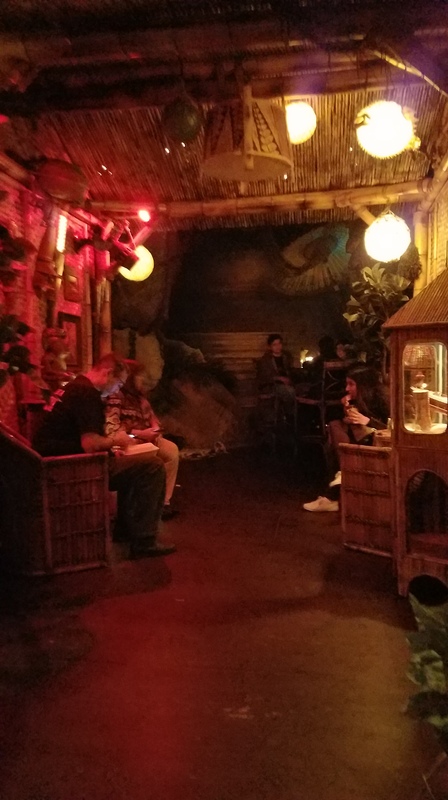 As I’ve seen in many discussions on social media, there are some very strong opinions about some of these places that don’t quite fit into the Tiki mold the way that bars like the Tiki-Ti, the Mai-Kai, or Tonga Hut do. Often times, the opinions will be about the drinks. If it’s not that, it’s usually about the decor and vibe. But either way, there are LOTS of opinions! I will begin with Lono, which recently opened in the summer of 2017. It has been met with a mixture of acceptance, and dare I say, a little scorn? 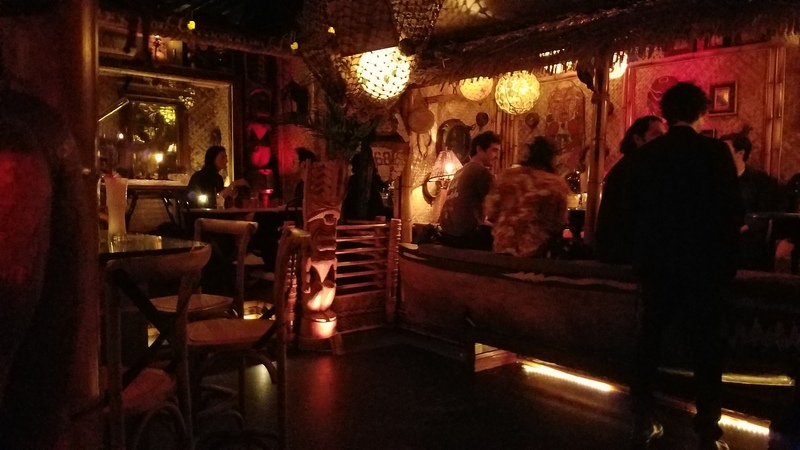 The most common complaints I’ve read all center around one statement: “It’s not Tiki!” Well, it’s not what we’ve come to expect from a Tiki bar, is it? Definitely not. The interior is incredibly spacious, with an almost minimalist approach to the decor (and minimalist is not something Tiki is known for!). The place screams 30’s-40’s old Hollywood – something that would harken back to the days when the OG Don The Beachcomber was serving up their tropical cocktails on McCadden, albeit, a bit fancier. And this, friends, is exactly why I like it. If you go on Lono’s Facebook page, the description says it perfectly: It is a “Tropical & Oceania-themed venue”. 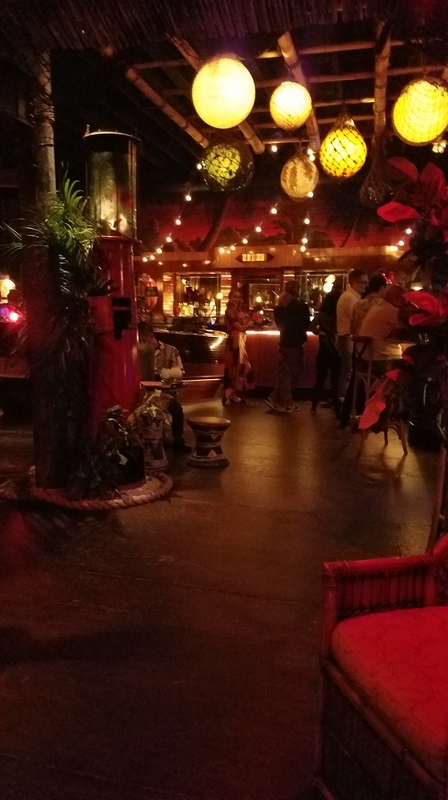 Unfortunately, you have online rags like Urbandaddy and Eater LA who see the bamboo decor and drinks, then publish derp-y articles like this one, calling it a Tiki bar, the latter using that dreaded word, “kitsch”.Frankly, I think that totally doesn’t describe the decor at Lono. It’s well thought-out, and stylish for what it is intended to be. The ambiance is nice, and the bar is dimly lit, save for an area near the front of the bar, which has a window. I’m not going to gripe about that, especially if I have the option to sit somewhere away from it, which I do. Toward the back, there is an area which is more open-air, with covered seating areas that could probably seat four or five people each – it wasn’t open when we visited, but we got to take a peek, and it looks super nice and cozy. The staff told us they typically open that area on the weekends when there is more traffic. They serve food, as well, but we didn’t have any this time. I’ve read good things about it, so perhaps I’ll give it a try next visit. 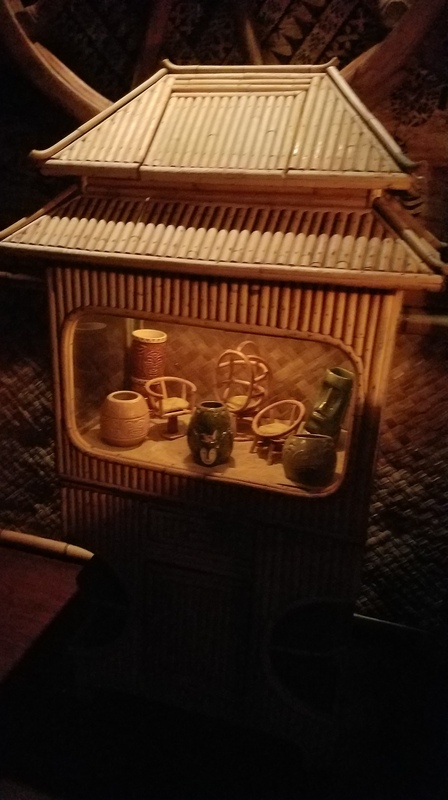 Perhaps it is not every tikiphile’s cup of tea (or glass of Mai Tai), but Lono as a whole is very aesthetically pleasing. 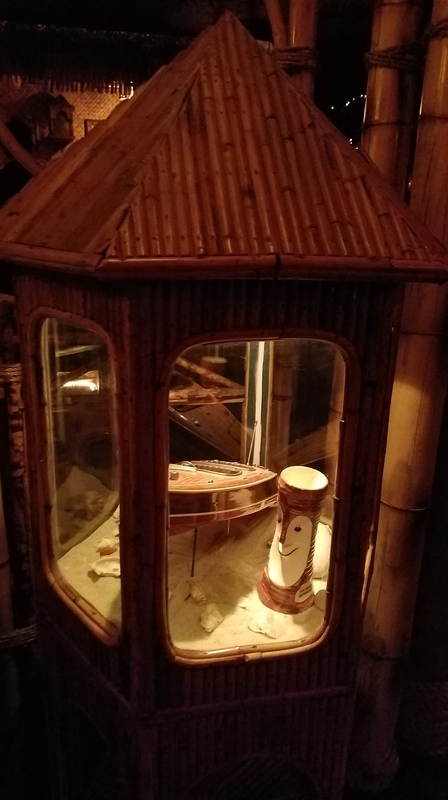 Be sure to check out their display cabinet, full of nautical and vintage memorabilia, with a splash of tiki stuff in there, for good measure. Ok – let’s talk about the drinks, now! I was pretty impressed with what I drank – I tried the daiquiri, and the Missionary’s Downfall. The daiquiri is one of the best I’ve had anywhere, without a doubt. The Missionary’s Downfall was spectacular as well – very frothy, and refreshing. This seems to be the one thing many tikiphiles actually agreed on; the drinks are pretty damn good. 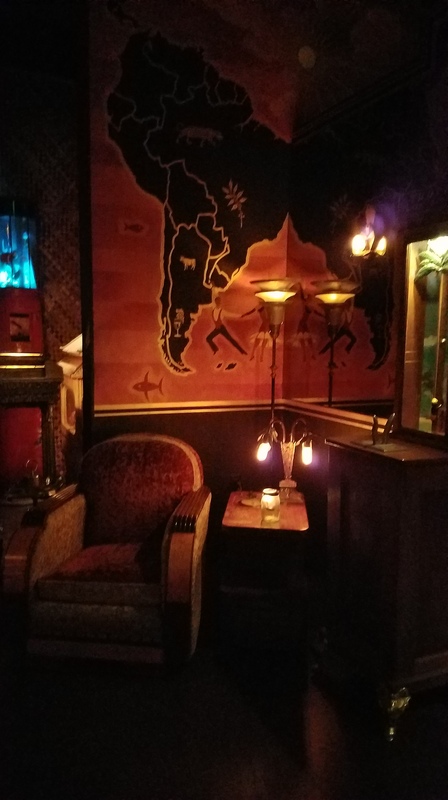 But I still get the sense that people look at Lono like a mistress – you feel bad cheating on your favorite true tiki establishment, but you just really like the place. Yes, it has nautical decor, and no, it does not have all the usual trappings of a tiki bar, but it has its place, and I hope it sticks around. The vibe was warm and pleasant, and the bartender was attentive and very friendly. For me, that is what makes or breaks a place, at the end of the day. I am definitely a fan of Lono, and I plan to return next time I get the chance! You can’t get much more hype, I think, than the hype surrounding the opening/re-opening of Pacific Seas in the old Clifton’s Cafeteria. 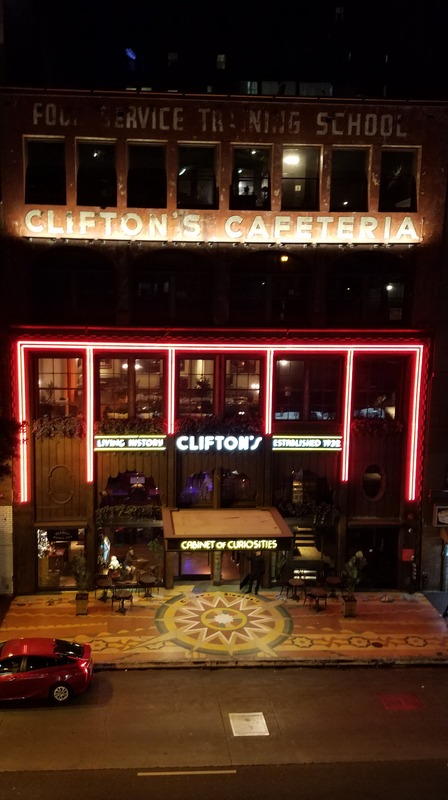 Clifton’s has a storied history, which you can read about here. Its founding location, named Pacific Seas, was a tropical-themed restaurant. Although the original location was eventually demolished, Clifton’s Brookdale location, the only one left standing, was purchased by an ambitious buyer, who wanted to pay homage to the old Pacific Seas by installing a tropical bar inside the building, which already houses several bars, along with the cafeteria, and a steakhouse. Pacific Seas is not readily obvious to the first-time visitor. John-O and I were walking down a hallway in one of the upper floors, when we came upon a huge mirror. He gave it a push, and it revealed the entrance to the bar. My mouth dropped in sheer amazement and delight – it was magical. We walked up the steps, and entered the map room, which had a map wallpaper, and beautiful art-deco chairs, as well as nautical-themed decor. As you make your way closer to the bar, you see fish float lamps, tikis, bamboo decor, and masks. The great tiki bar designer, Bamboo Ben, was responsible for the interior, which is a gorgeous collection of eye candy for any tikiphile. Some of the decor from the now-defunct Bahooka restaurant also made it into Pacific Seas. The huge boat in the middle of the place is pretty neat-looking, although its presence can seem a bit weird to others. The bar behind the boat is straight up art-deco; it’s truly beautiful to look at. Just about every place you look at inside Pacific Seas is a feast for the eyes. But how are the drinks?? Well, that depends on who you ask, as this is another topic that is up for debate. The general consensus is that the drinks are “meh”, to put it succinctly. Some people think they’re downright terrible. One person whose comment I read online was adamant that the drinks were bad enough, and it was so crowded, that he would never return. Ouch! Due to how busy our night was, and the number of places we went to that night, I decided to just have one drink – a Painkiller. I regret I didn’t get a photo of it, because it was very attractively served in a large snifter glass, with freshly-grated nutmeg, and an orchid garnish. I took a sip, and was happy with how nice, and balanced it tasted. It didn’t taste as high-octane as others I’ve had, but I didn’t care about that. The drink achieved its purpose – it accentuated the experience I was already having inside the bar, and did it well. Isn’t the whole experience what it’s all about? 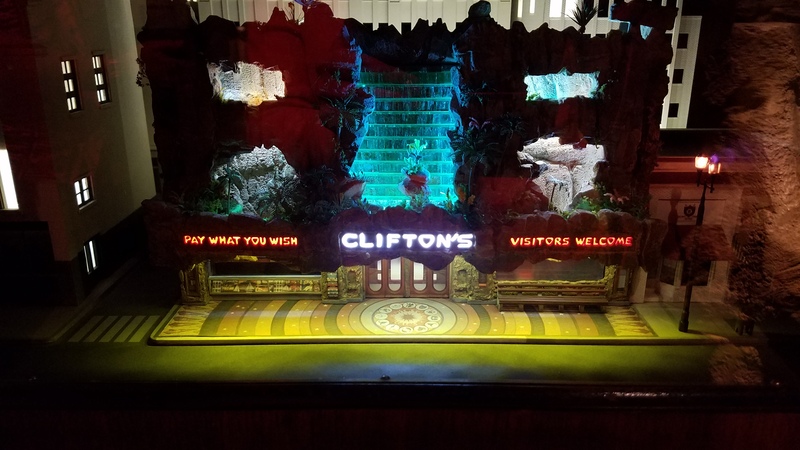 I would say so – I loved Clifton’s, and definitely plan on visiting again! 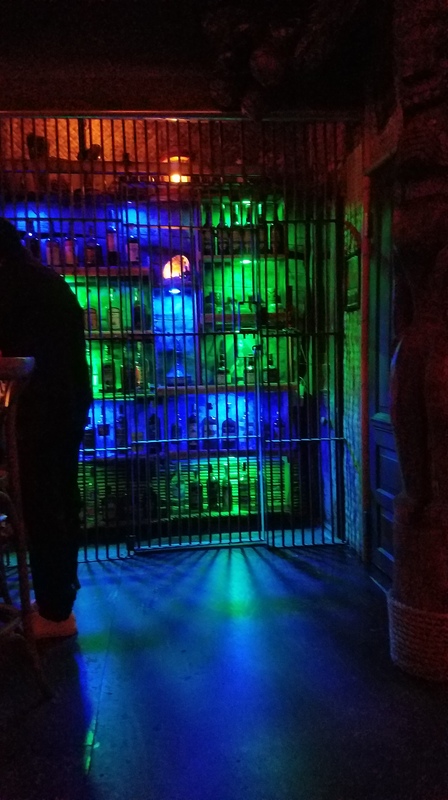 I think one of the best things we can do to help tiki/tropical/nautical/exotica-themed establishments is to keep an open mind when visiting. If you don’t like something, it’s OK to speak up and say something – after all, it’s your money you’re spending. Remember that there may be others who might enjoy the place, even though you don’t, so being automatically dismissive is not the best course. The only time I ever refused to return to a place was after I visited Pilikia here in Dallas. More than anything, it was because after I submitted an email detailing my bad experience and concerns, the response I got was very cold, and devoid of any desire to make things right. 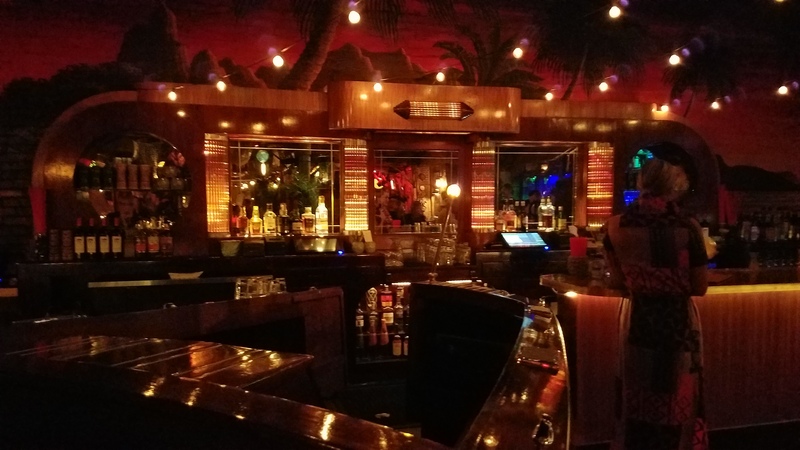 We are fortunate to have new tiki bar blood on the scene (Well, maybe most of you are, because we still don’t have a tiki bar here in Dallas), and we should try to support the ones who actually care, and help them along as much as we can. Disdain and apathy led to the first Tiki purge of the 70’s and 80’s – I sure would hate to see it happen again.